The Belfast Telegraph Top 100 is a flagship business publication for Northern Ireland. The high-quality, 64-page full-colour glossy showcases the top 100 companies in Northern Ireland in order of pre-tax profits, giving an invaluable snapshot into the health of the economy and the companies which are driving Northern Ireland forward. And special features by business leaders also hone in on our most important sectors from food to manufacturing and IT. The Belfast Top 100 has been published for 24 years and this year, as we await the outcome of Brexit, is more eagerly than ever by business and the public. The magazine is editorially driven but also provides an important commercial opportunity for businesses and service providers to reach their audience. Since 2015, the list of 100 companies has been compiled by the esteemed economist John Simpson on the basis of company reports filed at Companies House. 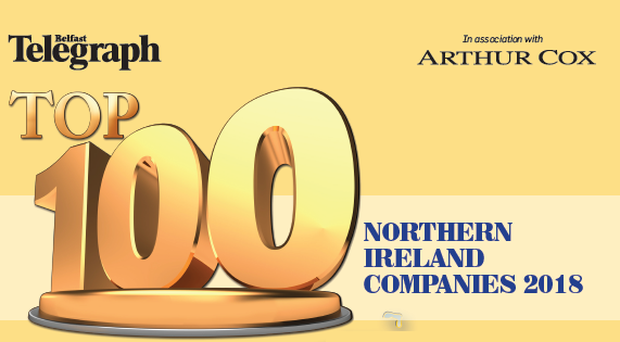 The launch of the Belfast Telegraph Top 100 Companies in association with Arthur Cox. By Margaret Canning Economist John Simpson has urged the leaders of Northern Ireland's top companies to start speaking out about Brexit. By Margaret Canning, Belfast Telegraph Business Editor The Belfast Telegraph Top 100 Companies 2018 in association with Arthur Cox has been published.